My kids were huge fans of the Mickey Mouse Clubhouse series growing up, but as often happens when kids get older, their tastes change. My five-year-old daughter recently quipped that Mickey Mouse Clubhouse was a baby series and that she was too old to watch it. Yes, my heart ached at the thought of my little baby girl feeling too old for something. My three-year-old son still watches Mickey Mouse Clubhouse, but it has become apparent lately that he's starting to outgrow it too. He has been requesting more Paw Patrol and Blaze and the Monster Machines lately. This age progression is something that Disney has really put an emphasis on in recent years. We have seen it with Doc McStuffins and Sofia the First. Not only is Disney starting to add shows that connect with children at different levels of development, but they are growing their characters so that they can "age" with their audience. A perfect example of this is Mickey & The Roadster Racers. Disney has taken their core characters from Mickey Mouse Clubhouse and put them in a more action-oriented series that will appeal to not only an older crowd but also more with boys. My son absolutely loved Mickey & The Roadster Racers and my daughter seemed to enjoy them as well given her fondness of Minnie and Daisy. It's not that the later Mickey Mouse Clubhouse episodes didn't introduce more action, it's just that the concept is a bit limited and come on, Mickey & The Roadster Racers has transforming cars, what else could an older toddler want? While these episodes serve the dual purpose of establishing a new series and reconnecting with audiences who may have outgrown Mickey Mouse Clubhouse, Mickey & The Roadster Racers does a superb job of forging their own identity. As my kids get older, I worry sometimes that they might be growing up too fast. As a society, it seems that we are all in a rush to get old, but really shouldn't it be the other way around? Shouldn't we strive to stay as young as we can for as long as possible? I think so and thankfully, my children connected with Mickey & The Roadster Racers in a way that gives me hope that they might hold on to their innocence of youth for at least a few more months. At this point, I'll take all the time that I can get. As with all of the recent Disney Junior offerings, this DVD comes packed with special features, including bonus episodes and two music videos. The extra content was nice and gave my wife and me almost a complete 90 minutes of sweet, peaceful relaxation, but the real kicker was the included license plate. The license plate wasn't a flimsy piece of plastic, but rather a metal plate that is customizable so that you can use the included stickers to put your child's name on it. My son Gavin loved this license plate and demanded that I find a way to attach it to his little replica four-wheeler. Thankfully, I was able to use my Jedi skills to get it stay on and he couldn't be prouder to have his own personalized license plate on "his car." 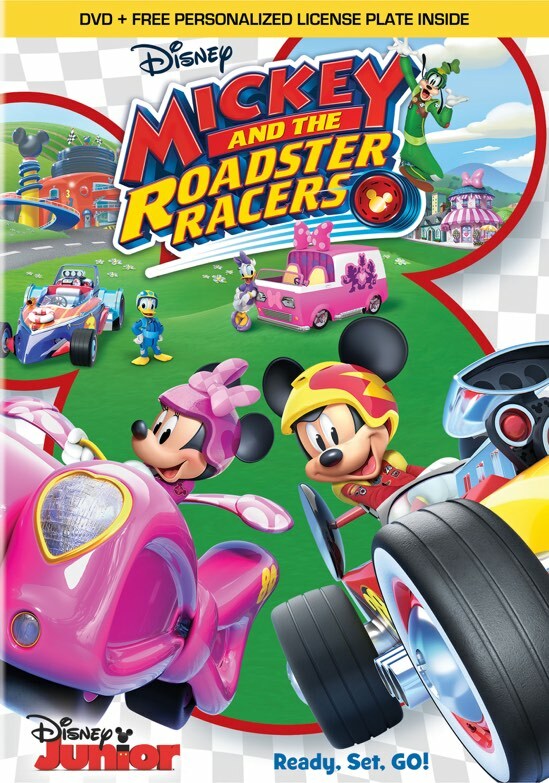 Mickey & The Roadster Racers is currently available on DVD and is a great option for older toddlers who grew up on Mickey Mouse Clubhouse and are looking for something a little more advanced, while also giving parents the Disney peace of mind.